Due to constant growth in user traffic and digital transformation happening across various industries, Telecom Service Providers have to address this demand with continual investments in network scalability. They usually have a diverse set of proprietary hardware which hosts individual network components and consumes considerable amount of space, power and skilled resources necessary to integrate & operate the hardware. All these factors lead to a significant increase in OPEX & CAPEX from operating and maintaining complex hardware based network elements. Moreover, these hardware-based network elements rapidly reach EOL (end of life), requiring much of the procure-design-integrate-deploy cycle to be repeated with little or no revenue benefits to TSPs. Happiest Minds Technologies has been working on creating test, validation and test automation frameworks and accelerators as part of the Datacenter Testing service offerings portfolio. This covers verification and validation of the NFVI, NFVO and VNF, VNF-VNFM, MANO and all the other layers of the ETSI NFV reference Stack. The testing phases covers Test planning, Test Labs/scenario setup, Test Execution and Test Report. The Test types covered are Dev-Test, Functional Test, System Test, Performance and customer use cases validation apart from First Office Application (FoA) support. Happiest Minds has an independent Testing services practice dedicated towards SDN and NFV domain within the overall Data Center testing portfolio. Our value proposition is E2E Test Automation covering NFVI, VNF and NFV-O layers. Network Function Virtualization (NFV) is an initiative driven by ETSI NFV ISG to help reduce the above complexities caused by diverse hardware, by running vendor applications on common commercial, off-the shelf (COTS) hardware by leveraging standard IT virtualization technology to consolidate many network equipment types onto industry standard high volume servers, switches and storage, which could be located in data centers, Network Nodes and in the end user premises. Furthermore, is expected to deliver three significant benefits to service providers: improved service agility, reduced equipment expenditure and improved operational efficiency. Of these, service agility appears to be to the key benefit expected by the industry. 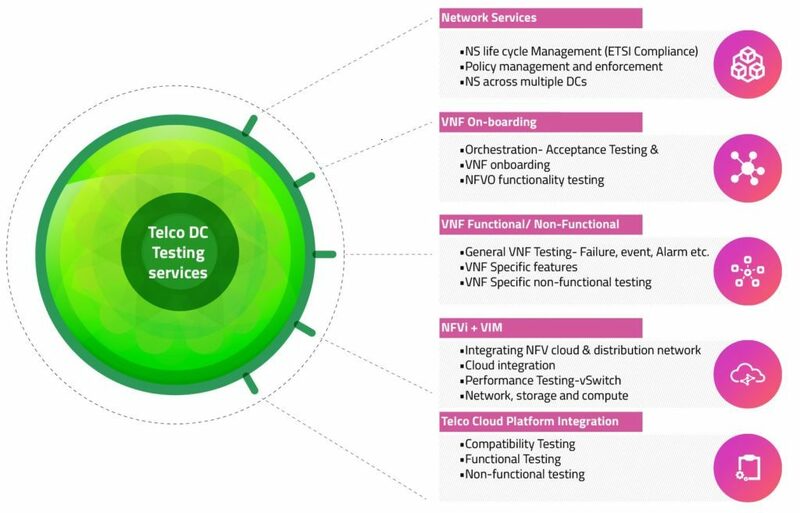 A detailed Datacenter Testing Offering overview focused on NFV is provided in the figure below with a direct correlation to the ETSI NFV ISG standard. Happiest Minds has been working in the SDN space since 2013, starting initially with validation of the OpenFlow API, OvSwitch, OpenFlow conformance protocol testing for customers. We have built strong expertise while executing projects on OpenFlow, SDN ODL controller functionality, contribution to open source like ONOS, ODL and working on programs on ODL CSIT. Area worked on include North Bound/South Bound API Testing, SDN to NFV integration through OpenStack, SD WAN, Orchestration functionality testing, Testing of VNF related BNG, Fixed Access with SDN Controller based Deployment (vCPE, vPE, vFW, vNAS, vRouter, etc) and Yang Model, NetConf via Rest API, Soap API testing. Currently, the testing services cover feature testing of the SDN Controller, Functional testing of NFV & SDN Network Applications, SD-WAN Manager Testing, multi-controller testing and pre-deployment testing and the associated Test Automation framework to ensure higher level of automation using Python, Selenium, etc. We have created innovative testing approaches like Model Based Testing designed upon open source components and providing significant benefits in reduced effort, automatically generated reusable repository of test case collateral across similar type applications, improved Test coverage management apart from early & improved bug detection. A summary of the SDN Test approach is mentioned. OpenFlow and SDN Test case & script development for a Network Equipment Provider. Test Automation framework enhancement for ODL functionality integrated with OpenStack via Neutron API for a Networking vendor. SD WAN Manager validation & verification. IoT Gateway Integration with SDN Controller for Monitoring functionality.